This article is about the perception or emotion. For the band, see The Feeling. For other uses, see Feelings. People buy products in hopes that the product will make them feel a certain way: either happy, excited or beautiful. Some people buy beauty products in hopes of achieving a state of happiness or a sense of self beauty. Past events are used in our lives to form schemas in our minds, and based on those past experiences, we expect our lives to follow a certain script. Individuals in society predict that something will give them a certain desired outcome or feeling. Indulging in what one might have thought would've made them happy or excited might only cause a temporary thrill, or it might result in the opposite of what was expected. Events and experiences are done and relived to satisfy one's feelings. Details and information about the past is used to make decisions, as past experiences of feelings influence current decision-making, how people will feel in the future, and if they want to feel that way again. Gilbert and Wilson conducted a study to show how pleased a person would feel if they purchased flowers for themselves for no specific reason (birthday, anniversary, or promotion etc.) and how long they thought that feeling would last. People who had no experience of purchasing flowers for themselves and those who had experienced buying flowers for themselves were tested. Results showed that those who had purchased flowers in the past for themselves felt happier and that feeling lasted longer for them than for a person who had never experienced purchasing flowers for themselves. Arlie Russell Hochschild, a sociologist, depicted two accounts of emotion. The organismic emotion is the outburst of emotions and feelings. In organismic emotion, emotions/feelings are instantly expressed. Social and other factors do not influence how the emotion is perceived, so these factors have no control on how or if the emotion is suppressed or expressed. In interactive emotion, emotions and feelings are controlled. The individual is constantly considering how to react or what to suppress. In interactive emotion, unlike in organismic emotion, the individual is aware of their decision on how they feel and how they show it. Erving Goffman, a sociologist and writer, compared how actors withheld their emotions to the everyday individual. Like actors, individuals can control how the emotions are expressed, but they cannot control their inner emotions or feelings. Inner feelings can only be suppressed in order to achieve the expression one wants people to see on the outside. Goffman explains that emotions and emotional experience are an ongoing thing that an individual is consciously and actively working through. Individuals want to conform to society with their inner and outer feelings. Anger, happiness, joy, stress, and excitement are some of the feelings that can be experienced in life. In response to these emotions, our bodies react as well. For example, nervousness can lead to the sensation of knots in the stomach. Feelings can lead to harm. When an individual is dealing with an overwhelming amount of stress and problems in their lives, it can lead to self-harm. When one is in a good state of feeling, they never want it to end; conversely, when someone is in a bad state, they want that feeling to disappear. Inflicting harm or pain to oneself is sometimes the answer for many individuals because they want something to keep their mind off the real problem. These individuals cut, stab, and starve themselves in an effort to feel something other than what they currently feel, as they believe the pain to be not as bad as their actual problem. Distraction is not the only reason why many individuals choose to inflict self-harm. Some people inflict self-harm to punish themselves for feeling a certain way. A gut feeling, or gut reaction, is a visceral emotional reaction to something. It may be negative, such as a feeling of uneasiness, or positive, such as a feeling of trust. Gut feelings are generally regarded as not modulated by conscious thought, and as a reflection of intuition rather than rationality. The phrase "gut feeling" may also be used as a shorthand term for an individual's "common sense" perception of what is considered "the right thing to do"; such as: helping an injured passerby, avoiding dark alleys and generally acting in accordance with instinctive feelings about a given situation. It can also refer to simple common knowledge phrases which are true no matter when said, such as "Water is wet", "Fire is hot", or to ideas that an individual intuitively regards as true, without proof (see "Truthiness" for examples). The way that we see other people express their emotions or feelings determines how we respond. The way an individual responds to a situation is based on feeling rules. If an individual is uninformed about a situation the way they respond would be in a completely different demeanor than if they were informed about a situation. For example, if a tragic event had occurred and they had knowledge of it, their response would be sympathetic to that situation. If they had no knowledge of the situation, then their response may be indifference. A lack of knowledge or information about an event can shape the way an individual sees things and the way they respond. Timothy D. Wilson, a psychology professor, tested this theory of the feeling of uncertainty along with his colleague Yoav Bar-Anan, a social psychologist. Wilson and Bar-Ann found that the more uncertain or unclear an individual is about a situation, the more invested they are. Since an individual does not know the background or the ending of a story they are constantly replaying an event in their mind which is causing them to have mixed feelings of happiness, sadness, excitement, and et cetera. Individuals in society want to know every detail about something in hopes to maximize the feeling for that moment, but Wilson found that feeling uncertain can lead to something being more enjoyable because it has a sense of mystery. In fact, the feeling of not knowing can lead them to constantly think and feel about what could have been. There are two main types of emotion work: evocation and suppression. Evocation is used to obtain or bring up a certain feeling and suppression is used to put away or hide certain unwanted feelings. Emotion work is done by an individual, others upon them, or them upon others. Emotion work is done to achieve a certain feeling that one believes they should feel. Three more specific types of emotion work are cognitive, bodily, and expressive. Cognitive changes images, bodily changes physical aspects, and expressive changes gestures. A person who is sad uses expressive emotion work to lift their spirits by trying to smile. A person who is stressed uses bodily emotion work by trying to breathe slower in order to lower stress levels. 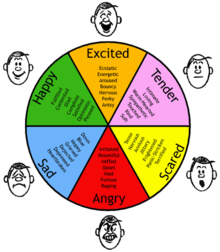 Emotion work allows individuals to change their feelings to suit the current situation. Feelings are deemed appropriate if they fit the current situation. Since individuals want to fit in and be seen as normal, they are constantly working on their feelings in order to fit the situation. Emotion work is more so how people want to feel or how they want other people to see them feel. Feelings are not permanent, but an ongoing thing because people constantly try to bring up, suppress, or manage feelings. Class differences influence and varies how a parent raises their child. Middle-class parents raise their child through the use of feelings and lower-class parents raise their children through behavior control. Middle-class parents and lower-class parents raise their children to be like them feeling and behavioral wise. Middle-class children get reprimanded for feeling the wrong way and lower-class children are punished for behaving badly. Lionel Trilling, an author and literary critic, described the technique that the middle- and the lower-class parents use. Under-working and overworking their children's feelings causes them to seek approval of their feelings in the future. When children of lower-class and of working-class families join the workforce, they are less prepared for emotional management than middle-class children. Wikisource has the text of the 1921 Collier's Encyclopedia article Feeling. 1 2 Wood, Stacy L.; Bettman, James R. (2007-07-01). "Predicting Happiness: How Normative Feeling Rules Influence (and Even Reverse) Durability Bias". Journal of Consumer Psychology. 17 (3): 188–201. doi:10.1016/S1057-7408(07)70028-1. 1 2 Hochschild, Arlie (1979). "Emotion Work, Feeling Rules, and Social Structure" (PDF). American Journal of Sociology. 1 2 Hochschild, Arlie Russell. "The Managed Heart: Commercialization of Human Feeling" (PDF). ↑ Bar-Anan, Y; Wilson, T. D.; Gilbert, D. T. (2009). "The feeling of uncertainty intensifies affective reactions". Emotion. 9 (1): 123–7. doi:10.1037/a0014607. PMID 19186925.